DIDEROT - Carte de la Californie et des Pays Nord-Ouest. . . 4de Carte. DIDEROT, D. - Carte de la Californie et des Pays Nord-Ouest. . . 4de Carte. Carte de la Californie et des Pays Nord-Ouest. . . 4de Carte. - DIDEROT, D.
Title : Carte de la Californie et des Pays Nord-Ouest. . . 4de Carte..
Map maker : DIDEROT, D.. Size : 11.5 x 14.3 inches. / 29.2 x 36.2 cm. 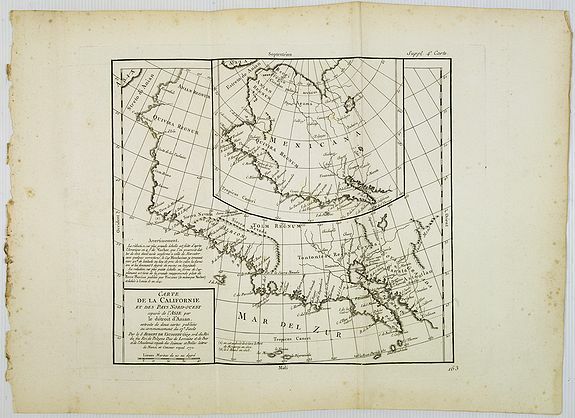 Description :Diderot's famous 2 on 1 map showing the two early mappings of the west coast of North America, the first after Visscher, the second after Plancius' World map. Both show the Straits of Anian, Quivera, Baja and a similarly projected east-west coastline. The larger map includes more detail along the coastline and in the Sierra Nevada Mountains, as well as a truer orientation of Baja California. Diderot's map were one of the first surveys of comparative cartography, tackling a number of the early misconceptions of the west coast of North America and the North-eastern Asian Coastline. The form an excellent baseline for collections of this region, as the maps they illustrate are generally extremely expensive or impossibly rare. Condition : Ample margins, as issued. In good condition. A strong impression printed on thick paper.